ROCKVILLE, MD – FEBRUARY 7, 2019 – Sparks Group, a leading staffing agency in the Accounting & Finance, Government, Human Resources, IT, Marketing, and Office/Administrative industries announced today that they have won ClearlyRated's Best of Staffing® Talent Award for providing superior service to job seekers. Presented in partnership with CareerBuilder, ClearlyRated’s Best of Staffing Talent winners have proven to be industry leaders in service quality based entirely on ratings provided by the permanent and temporary employees they’ve helped find jobs. On average, candidates who have been placed by winning agencies are 1.7 times more likely to be completely satisfied with the services provided compared to those placed by non-winning agencies. Less than 2% of all staffing agencies in the U.S. and Canada have earned the Best of Staffing Award for service excellence. This marks the fourth year in a row and sixth time overall that Sparks Group has been selected for this award. Focused on helping connect people with the right jobs to further their career, Sparks Group received satisfaction scores of 9 or 10 out of 10 from 68% of their placed job candidates, significantly higher than the industry’s average of 45%. 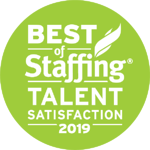 “We are proud and honored to be recognized as a Best of Staffing Talent Award recipient once again by ClearlyRated,” said Owner and CEO Steve Sparks. “This award is a testament to our team’s hard work, dedication, and commitment to providing outstanding service to job candidates in Maryland, Virginia, DC, North Carolina, and beyond.